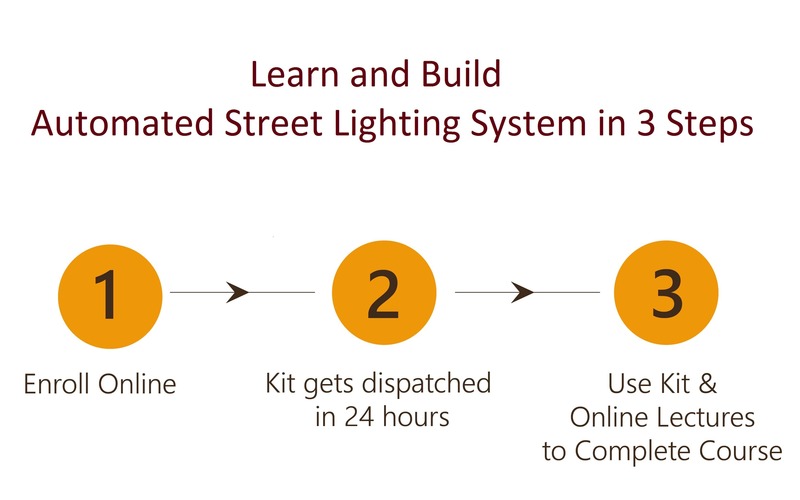 This is a project-based course in which you will build an IoT based Automated Street Lighting System that automatically switches the street light ON and OFF based on the amount of sunlight present. This is one of the key components of smart cities where energy will be used very efficiently by turning the streetlights ON and OFF at the right time as needed. The system will be have an LDR sensor that detects the light intensity continuously and sends data to the Arduino. The data will be sent to the cloud for storage and analysis where reports can be generated to show the duration when lights are ON, the amount of power consumed and saved. 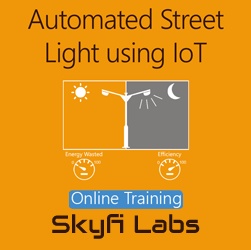 Skyfi Labs Automated Street Lighting using IoT Project Kit will be dispatched to you within 24 hours of enrollment. Use this kit along with the online portal to learn and complete the project based course. As you complete the course your project will also be completed. Skyfi Labs Automated Street Lighting using IoT Project Kit containing the following items will be dispatched to your address within 24 hours. One kit will be sent per team. Anybody interested in Internet of Things(IoT),ESP 8266 architecture, Energy Efficient Systems, LDR Sensors Calibration and Arduino Programming can take up this course.